Polex Environmental Engineering have recently installed a turn-key dust collector system at Visy Board in Yatala, Queensland. Dust extraction was required as a result of fine dust generated from cardboard trim produced by several cardboard cutting machines. Polex Environmental Engineering designed, supplied and installed a bag type reverse-pulse dust extraction system with 135,360 m3/h airflow capacity, 1128 m2 filter area, a 185kW centrifugal fan, a screw feeder and a rotary valve. The waste is discharged into a 3 m3 bin under the rotary valve. The dust extraction system was designed to extract fine dust from four cutting machines. Currently, there are only three machines at the site. The system adjusts the airflow according to how many machines are in operation at any one time through pneumatically operated slide dampers and a 185kW variable speed drive. Polex reverse-pulse dust collectors are constructed from either powdercoated 3mm or painted 5mm thick mild steel. A standard feature of Polex dust collectors is 24VDC solenoid pulse valves and electronic pulse controllers. This provides increased electrical safety for service and maintenance. Polex dust collectors can also be supplied with increased surface treatment or fabricated from stainless steel for corrosive environments. 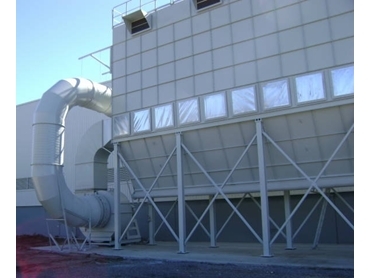 Polex dust collectors can be manufactured to suit specific space constraints.